The chooser menu with two options. The same chooser menu showing the PAYLOAD_PARAM data passed by coreinfo. 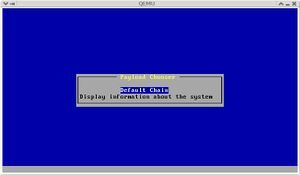 The same chooser menu over serial. The timeout message. If the key isn't pressed, then the menu is displayed. Bayou is the working name for a coreboot payload that can choose, load and run other payloads from a CBFS on the ROM. Go to the Payload section in "make menuconfig"
Now, you'll need to create a bayou.xml file containing the menu entries you like. Start by copying and then editing the sample file bayou.xml.example inside payloads/bayou. The file bayou.elf is your finale Bayou payload file, which the build system will include in your coreboot image. We need a little bit of originality in the names of our payloads, as Peter discusses here. In the grand tradition of El Torito, we decided to name the project after the restaurant where we ate lunch and debated the payload chooser during the coreboot summit 2008 in Denver: Bayou Bob's. The word bayou is French in origin, but it famously describes slow or stagnant streams and swamps in the southern United States (see also Bayou at wikipedia. The name in no way describes the project itself, which should neither be slow nor swampy. This usage model presents a menu to the user containing the descriptive names of all the payloads in the CBFS. The user selects an item from the list, and Bayou loads and runs the payload. If the payload is responsible enough to be able to exit cleanly (as all libpayload payloads should be able to do) and return control to Bayou, then the user can select a different payload. 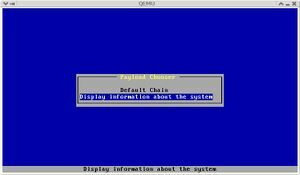 Chaining is a non-interactive usage model wherein Bayou will load and execute a series of payloads in order. The payloads must be able to return control to Bayou cleanly (except the "final" payload which isn't expected to return). This will loosely imitate a traditional BIOS in that one could define a "BIOS setup screen" payload that ran before FILO or other kernel bootloader. The architecture of Bayou is rather simple. 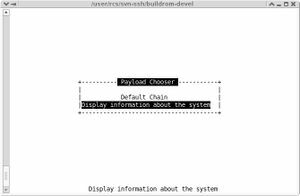 It is a libpayload based application with code for reading and loading payloads from a CBFS and a front end user interface. The Bayou code itself lives below 640k (0x19000) so that it can stay resident when loading payloads that would typically locate themselves at 1Mb or higher. Payloads that want to work cleanly with Bayou should not write to memory below 640k unless it is a "final" payload (i.e. something that will not return to Bayou, such as the Linux kernel). 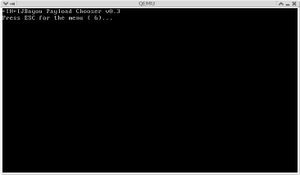 Bayou will read, load and execute payloads encoded in the Simple Executable Loader Format. If the timeout field is greater then 0 but not 0xFF, then Bayou will display a countdown message on the screen. If the user presses F1, then the chooser menu will be displayed. If the user does not press a key in the alloted time then Bayou will automatically start the item in the payload table that is marked as 'default'. If the timeout field is zero, then the default item will be chosen immediately without a timeout. If the timeout field is 0xFF. then the chooser menu will be shown immediately without a timeout. When the menu is displayed, it will list all top level items in the Bayou Payload Table, both chooser and chain items. When a chain item is selected from the menu (or as the 'default' item), then each of the sub-items listed in the payload table will be executed in order. Each sub-payload item is expected to return control to Bayou, except the last one. If a payload fails to return control, then the rest of the chain will not be executed. The ROM image is very dynamic in nature. New blobs of data can be added at any time during the build process or during runtime. This is why Bayou was designed to easily detect and use the payloads added to the CBFS through cbfstool and update its configuration without needing to touch the payloads. Timeout 1 bytes if the value of this field is 0, then the default item in the payload list will be executed immediately. If this value is 254 (0xFF), then the chooser menu will be displayed immediately. Any value between 1 and 254 indicates the amount of time (in seconds) that the system should wait. A chooser item is displayed in a list of other items on a menu. Each chooser item is associated with a single payload. A master chain item describes a chain of items that are to be executed one after another. Master chain items specify a title and may be displayed on the chooser menu. A number of sub chain items are tied to a master chain item and point to the specific payloads to be executed in the chain. nlen 4 bytes Length of the payload name, in bytes. This should be 0 for master chain items. name 'nlen' bytes Specifies the name of the CBFS file for the payload associated with this entry. Only valid for sub-chain items and chooser items. BPTBuilder is an utility used to parse the bayou.xml modified by the use and convert it into a binary file that is easily understood by the Bayou payload itself. The resulting binary file (bayou_payload_table a.k.a. bpt) is loaded into the CBFS by the build system. bpt_pentry This is the a payload entry, which can represent both a simple Chooser configuration or be the beginning of a Chain one. This is followed by more structs of the same type, one for each payload. In order to better support Bayou, some changes need to be made to coreboot and associated projects. The following are a few of the changes that would help. Making sure that every payload usable with Bayou does not reboot before returning. Add generic CBFS walking code. Modify the build system to allow the configuration system to modify the payload entry point. This page was last modified on 30 July 2016, at 12:13.